So I got up this morning and found a game from 91 playoffs between the Bulls and the Celtics. 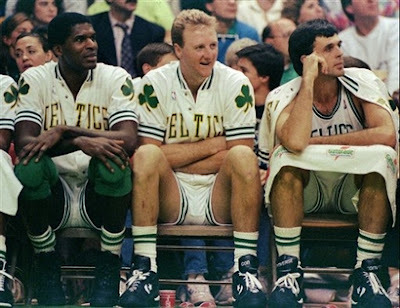 As I watched Parish, Mchale, and Bird take it to the Bulls I can't help but remember the days when Black and White Converse were as much a part of the Celtics as not having a Celtics dance team....oh wait. Regardless of recent changes, there aren't any current Celtics wearing Converse, at least at the end of last season. It just seems wrong that there isn't a Celtics player wearing Converse, hopefully this will change soon. 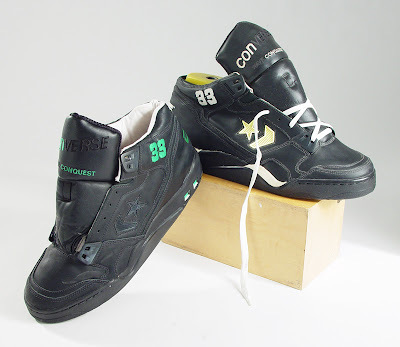 While I don't have that many pictures I did find some interesting shots of the Wave Conquest, a shoe in the early 90's that featured Converse Energy Wave technology. 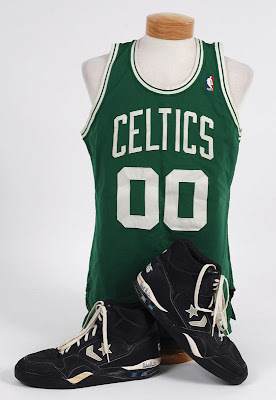 Below are Robert Parish and Larry Bird game worn versions. That's all for now, I hope I can find some more pictures of these. Thanks for reading and enjoy your weekends.